Includes: 5 meat and 2 cheese tray* w/pickle relish tray, potato salad, cole slaw, fresh bakery bread, mayonnaise, mustard and tomato and lettuce garnish the tray. 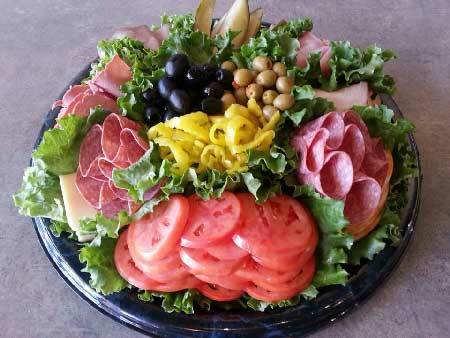 Relish Tray: California ripe olives, Spanish olives, deli pickle spears and sweet pepper rings. Choice of bread: marble rye, light rye, rye with caraway seeds, pumpernickel, whole wheat, whole grain and French white. *Includes Polish ham, turkey breast, lean roast beef, corned beef and Hoffman's hard salami, Swiss and co-jack cheese. Perfect for those meetings and functions where you can't get everyone to sit down at one table and eat. Everything is included and you literally eat out of this box! Includes: Deluxe sandwich off our Sandwich Board made on fresh deli bread or buttery croissant. Potato salad, hard-boiled egg, relish section*, big cookie, fork, knife, napkin, and condiments are included. Relish section includes: California ripe olive, Spanish stuffed olive, deli pickle spear and mild pepper rings. We will take any of your favorite sandwiches from our deli menu and place them on an attractively garnished tray for an impressive presentation; you just pay the regular menu price!! 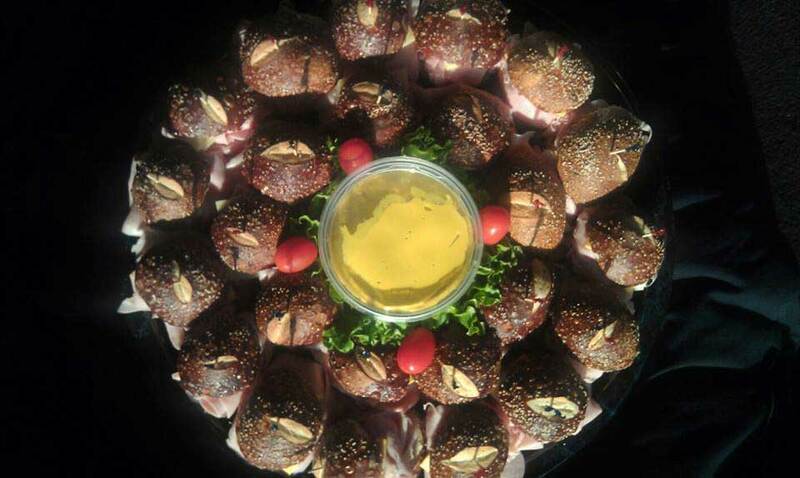 Petite deluxe sandwiches on assorted rolls. Includes your choice of meat, cheese, lettuce and tomato. Includes: mixed greens, tomato, cheddar cheese, cucumber, and black olives. Choice of dressing. Includes: ham, turkey, swiss and cheddar cheese, hard boiled egg, mixed greens and tomato. Includes: feta cheese, sweet pepper rings, red onions, California ripe olives, beets, Greek dressing, mixed greens and tomato. Includes: grilled chicken breast, garden fresh romaine lettuce, Parmesan cheese, croutons, and Caesar dressing. Your choice of meat* & two cheeses with lettuce, tomato,onions, mild pepper rings and Italian dressing. *Choices include: roast beef, Polish ham, turkey breast, salami, tuna salad or chicken salad. Havarti cheese, Colby cheese, lettuce, alfalfa sprouts, tomato, cucumber, black olives, mushrooms,onions, and Italian dressing. Ham, turkey, salami, Swiss cheese, lettuce, tomato, onions, mild pepper rings, sliced black olives and Italian dressing. Ham, pepperoni, salami, provolone, lettuce, tomato, green peppers, onions, mild pepper rings and Italian dressing. Perfect for early morning functions when everything needs to be on time and perfect first thing in the morning! 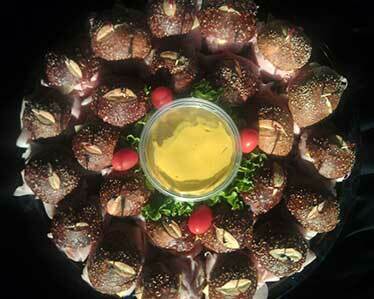 Trays include choice of assorted fresh bagels, danish, muffins, scones, and assorted juices. Includes: Philadelphia Cream Cheese, Smuckers Jelly, butter, plates, knives, forks and napkins. *Add Coffee Service to your Continental Breakfast for $2.00 per person. Includes: cream, sugar, cups and napkins. 10-person minimum. Choices include: a variety of cheesecakes, big cookies and brownies. PLEASE CALL FOR PRICING. Please call for pricing. Catering delivery available anytime with 24 hour notice. Prices based on 10 person minimum order. For orders of 10 people or less, please add $1.50 per person. Due to the necessary preparation involved with catering orders, a 50% cancelation fee will be assessed on orders cancelled within 12 hours of scheduled pick-up or delivery.